Today’s Money-Making SAHM is Misty Bailey. She is amazing…as you’ll come to realize when you read her interview below. 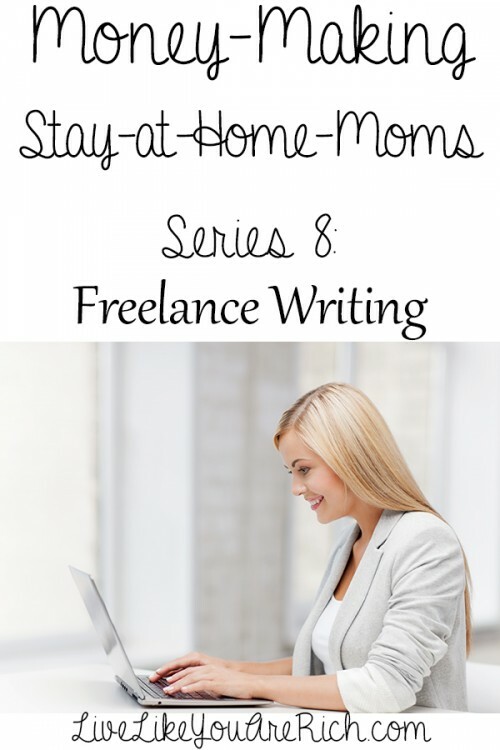 She is a freelance writer, mother of three, blogger, and Homeschooler. She helps supplement her husband’s income by working a few hours a day doing what she loves: freelance writing. She shares how you can too! A. For me it was out of necessity. I had ran an in-home daycare for seven years. Because we were homeschooling, and I had three kids I decided to close my daycare. We still needed a little bit of extra money coming in, so I began freelancing. A. I had been blogging for about a year or two, so I already had samples of online work. I opened up an account on Odesk and began applying for jobs. I believe the fact that I had been blogging gave me an advantage over other newcomers because I was able to provide samples of my work. I received my first job within a week after opening an account and within a month or two, I was making steady money and meeting my income goals. A. If you want to begin freelancing using a platform like Odesk or Elance, it is important to have samples of work. If you do not blog, write up a few pieces on topics you enjoy. Save them in PDF format and use them as samples. This will show that you are serious about writing, and it will show potential clients what you are capable of. A. I do not allow myself to freelance more than 10 hours a week. I could work more if I wanted too, but I have set those hours as a maximum for myself at this time. I want to be able to continue blogging, homeschooling, and interacting with my children. I can set my own hours, and overall the jobs are very flexible. I do have deadlines so I have to be able to set aside 2 hours a day to interact with my clients, and write. A. I wake up when my husband does (5 a.m.) and work after he leaves for work. I can typically get an hour or so in before the kids get up. If I still have work to do, I complete when my youngest is napping or after the kids go to bed in the evening. I set aside designated work hours and try to stick to them, but it is hard sometimes. A. No. However, as I said before having samples of your work is very important. You also need to be fairly proficient in Microsoft Word. I have also made myself familiar with Microsoft Excel and PowerPoint. Odesk has tests a freelancer can take to show how well they are in certain areas like blog writing, content writing, and creative writing. These tests will show what areas you need to work on. If you pass you can add the scores onto your profile to help potential clients see that you are proficient in your areas of expertise. Q. What is the income percentage you bring in? or How much do you make from this job? or Does the income help a little, medium, or is the main source of your family’s income? A. My income goal when I began was $100 a week. Since I started I have been able to raise my rates and am now making around $150 a week. The amount I make depends on what jobs I take. I have had steady long-term clients for a while now, but I will occasionally take a one-time job in addition to these jobs to bring in extra money. My income is considered supplemental. We rely on it, but not as a main source. A. If you have a blog, great! If you do not, pick a topic and write up a few pieces of work for samples. For example, if you want to get into education articles write a piece or two on curriculum development, learning styles, or something else. Once you have samples, set up a profile on Odesk. This is a great company for new freelancers! You can see a sample of my profile here. You will have to take an Odesk readiness test before you apply for jobs. This is a basic skills test and is not difficult. Once your profile is set up take a few tests in areas you are interested in. If you do not pass study the sections that you need to focus on and try again in a month. You can apply for jobs without passing tests, but they do help to show you are knowledgeable in that area. Now, you can begin applying for jobs! You will want to apply for as many as you can at first. You should be able to land an interview within the first week and a job within the first two weeks. Remember, you cannot be that picky when you first start out. You want to be able to get feedback scores and show that you can complete work and meet deadlines. Thank you so much Misty we really appreciate your sharing your information with us. Misty Bailey is a wife to Roger and a homeschool mom to three beautiful blessings. She resides with her family in Southern Ohio. She loves helping new homeschoolers and shares her struggles with time management, becoming unglued and finding joy in the everyday moments on her blog Joy in the Journey. This is a great article! I just got started on oDesk about ten days ago and have had a few interviews and job offers already. Thanks for posting this! You’re welcome and congratulations on getting started! Amber- Awesome! So happy you found the article. I hope you are able to make the additional money you desire through freelance writing! Great Amber! I hope it goes well for you and so glad you were able to glean from this post. Good luck! Hi, I love this article. I have wanted to write since I was quite young, but as you get older you release you need a career that can make money right away! So I have been doing childcare and now in home care with a couple kids. I would love to do something like freelance writing on the side. Could you tell me more about the interview stage for jobs? Is everything done online, communicating and submissing? Does it matter where in the world you are for the sites mentioned? Hi Samantha! Sorry, I just saw this. The interview stage for Elance and Odesk is all done online. Occasionally you may have to do a Skype interview. I have done this through my cellphone at home on wi-fi. It is basically just a phone call. This gives the client/freelancer an opportunity to chat about job related items. Otherwise all communication is done online through the freelance companies. Both companies do not recommend going off of their platform via private email. Hope that helps some! Thank you so much for running this series! I got started on Odesk last month after reading this post and it has been a great experience. I already have a few good clients and I’ve had fun while doing it. Amber- You are welcome! I’m so glad you have found it useful 🙂 Thanks for checking back and congratulations on getting started and working so quickly! !